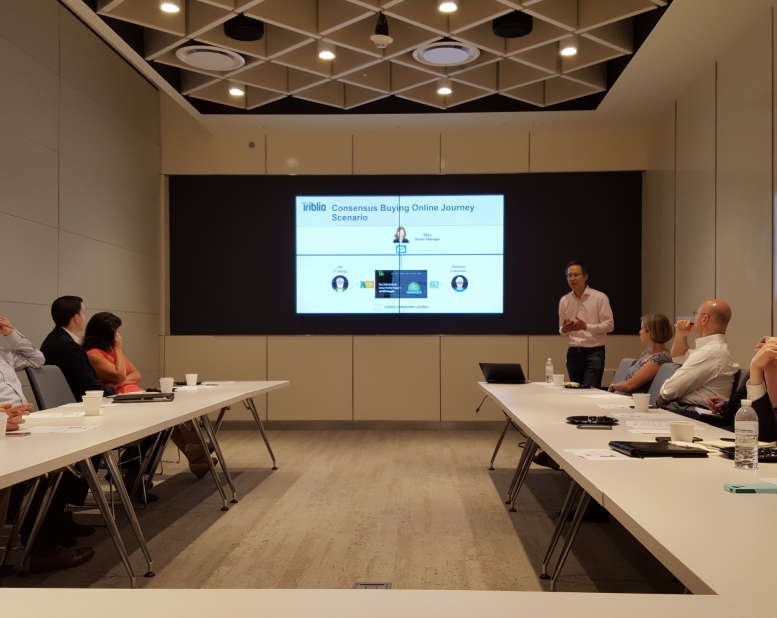 The Marketing Alliance (TMA) held its June “Hear From Your Peers” event on June 21, featuring a presentation from Triblio co-founder and CMO Jason Jue on how to boost demand with account-based marketing (ABM). In the past, ABM was thought of as a marketing strategy employed by large companies interested in targeting a few important customers. Thanks to the rapid rise of predictive, automated, and scalable technology, today ABM is becoming much more commonplace. According to a recent SiriusDecisons survey, 92% of B2B marketers worldwide say that ABM is “extremely” or “very” important to their overall marketing efforts. Jason’s presentation introduced ABM as “the strategic approach marketers use to support a defined universe of accounts.” Simply put, ABM targets accounts of grouped individuals rather than specific leads. Jason put ABM in historical context by explaining that it can be thought of as a foundational marketing strategy updated for today’s digital-based buyer’s journey. Where once we thought in terms of marketing communications, today we discuss content marketing. While foundational marketing approaches relied on CRM and database solutions, there’s now an increasing focus on predictive analytics. The same is true for lifecycle or field marketing. Those approaches are being enhanced or even supplanted by ABM. ABM revolves around the insight that for most B2B companies, 20% or less of customers drive 80% or more of revenue. With an individual lead-scoring approach, there can be many organizational stakeholders to target. Jason cited a statistic from the Corporate Executive Board, which found that 5.4 people are involved in the average B2B buying decision. Scoring each individual decision-maker and nurturing a conversation with all of them at scale with specific messages can be challenging. ABM groups each set of leads from the same company or organization, both anonymous and known, and then scores the entire account. This means there can be much more conversation throughout the entire buyer’s journey. Grouping is typically accomplished by mapping IP addresses to companies along with other methods. Jason detailed how ABM can generate some quick wins including growing contacts, supercharging digital media campaigns, and tailoring web content to specific audiences across properties. He also provided a number of case studies illustrating how ABM is generating real results for a range of B2B companies. 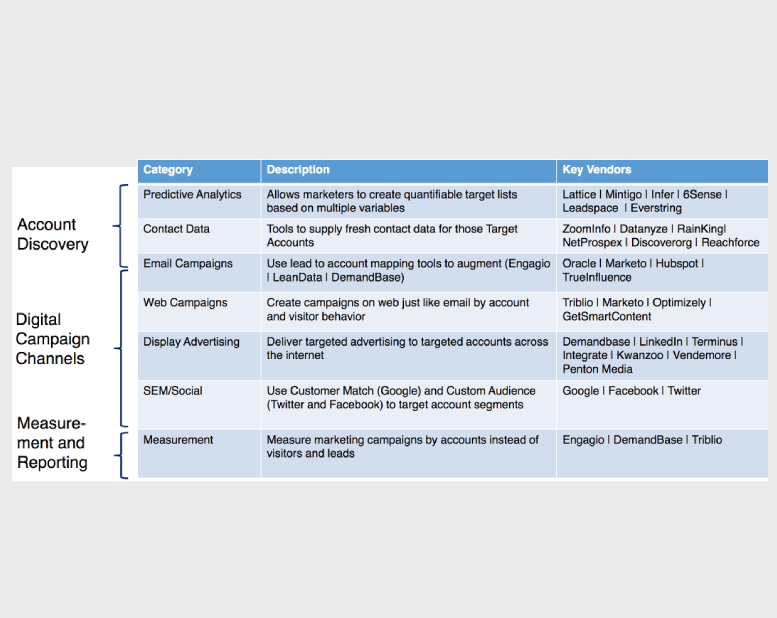 For those interested in building an integrated ABM campaign, here’s a detailed look at Jason’s example ABM tech stack. Jason’s presentation is a great example of TMA’s Hear From Your Peers events – well-attended gatherings that promote a high-level exchange of ideas among senior marketing professionals. Stay tuned for more info on the next TMA event in July.